Eric was born in Winnipeg in 1912 and attended the University of Manitoba, where he studied architecture, receiving a B.Arch and the Gold Medal in 1935. In 1936 and 1937, he studied architecture and planning at the Massachusetts Institute of Technology, earning an M.Arch in 1938. Upon his return to Winnipeg, Eric taught at the University of Manitoba and served as planning advisor to the provincial government, where he prepared the 1944 report on community planning for Manitoba’s Post-War Reconstruction Committee. He worked as a planning consultant for Yorkton SK and several Manitoba municipalities, leading the 1958 team that planned the new resource town, Thompson MB. In that same year, he prepared the campus master plan for the University of Manitoba. From 1945-1960, Thrift was Director of the Metropolitan Planning Commission for the Winnipeg area. The Commission had no regulatory powers and depended on its staff’s powers of persuasion and professional expertise to encourage the urban, suburban and rural municipalities to adopt, co-ordinate and implement plans. Eric was a persistent advocate of the benefits of planning, writing numerous articles and giving hundreds of presentations to community stakeholders to build the consensus needed for metropolitan planning. One newspaper described him as: “…a ’soft-sell’ artist-- a man who builds a careful and methodical case before recommending any major planning move to the municipal councils.” This “soft-sell” proved sufficiently effective that Manitoba established a metropolitan government for Winnipeg, with proper planning jurisdiction in 1960. Eric left his native Manitoba for a larger challenge in 1960, when newly-elected Prime Minister John Diefenbaker appointed him as General Manager of the National Capital Commission. 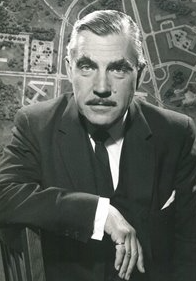 He implemented many of the components of Jacques Gréber’s landmark 1950 Plan for the National Capital, including several of the parks, parkways and the suburban greenbelt that grace the region today. He had less success in central Ottawa, where politically-connected developers defeated the efforts of the municipal and NCC planners to protect the view of Parliament Hill from the south. In 1970, Thrift was appointed as Queen’s University’s campus planner and as a founding Professor in its new School of Urban and Regional Planning. He oversaw a dramatic physical expansion of the university over the next decade, adding a west campus, re-landscaping the main campus and creating a much-loved waterfront park. He taught metropolitan planning and community design to the first generation of Queen’s planners and was Acting Director of SURP in 1971 and 1972. Appointed Professor Emeritus in 1981, he continued to teach in the following years. Eric Thrift was an energetic leader of provincial and national planning advocacy organizations throughout his career and a frequent contributor to Canadian and international conferences. He helped found the Community Planning Association of Canada (CPAC) in 1946 and its Manitoba branch in 1947. Eric was elected President of the Institute in both 1953-54 and 1961-62, the only person to lead the Institute on two occasions. Active in the American Society of Planning Officials (ASPO, now the American Planning Association), he was elected as ASPO’s president for 1964-65, the only Canadian to hold that post. He led the combined ASPO – CPAC Toronto conference in 1965, which was the largest gathering of planning officials held to that date. For his contributions to planning and its allied professions, Eric Thrift was also elected as a Life Member of ASPO and a Fellow of the Royal Architectural Institute of Canada (1961). He passed away in Kingston in 1995.